There is a wonderful girl I love, who inspired this post, but it is not only for her. This letter is for any girl, any woman, who has been hurt by life, and feels scared and empty. You are not alone. I know that seems like a simplistic platitude, but I want you to truly know it, to feel it deep within your soul. You are not alone. Our hurts may be different, our confusion might come from different places, and the dark path we are standing on might be hundreds of miles away...but the feelings are very much the same. I spent days and months, even a year, wondering if God was listening to my cries, or if He would ever speak to me again. Asking myself if I made it up - all those times I heard from Him before - or if I was crazy to believe in someone who no longer seemed to believe in me. Prayer seemed futile. I felt like a fake, and I was scared to admit it. It seemed like saying those words out loud would make it true; it would be a declaration from which I could never return. I have prayed like that father, "I believe. Help my unbelief." Not knowing what else to say, but hoping so much I had enough faith left to make it work. The image of the perfect Christian - she who never doubts, he whose prayers are always answered with a great miracle, they who always seem to be blessed beyond measure - that image is never the whole story. God is not magic, not someone you can control or bring into your own timing, and there is no formula to follow. We are all struggling. When you have the courage to be honest about your struggles, you will find others walking that same path with you. It took a long time to feel my faith strengthen and grow, but God did not leave me alone in my pain. I still struggle, and I still have to reach out to those fellow travelers for help, but I know that my prayers are heard by a real and loving God. If you don't have the words today, or you are scared to say them, allow yourself to be still and rest. I will sit beside the path with you, and watch. I will pray. And more than that, Jesus will. The Holy Spirit will. We will intercede for you in those dark days when you feel so alone. There will be very few moments of perfection, and most of them will not come as the result of planning or anything you can control. That does not seem very encouraging, but it is honest. I have learned you can get through anything in this life if you are honest about it. You are not your past - not the things that have been done to you, or the things you have done. You deserve to be seen without those filters. I can't promise that many people will take the time to look past them, but there will be some who do. Those people are special. Open up to them, allow them to see your heart, and allow yourself to see theirs in return. Jesus looks at you without those filters. You will screw up. But those screw ups do not define you. Neither do the mistakes, bad choices, hurt feelings, pain, confusion, or loss. You are more than those things. Your story has not ended. You have the capacity to show yourself great love and mercy, or to hurt yourself more than anyone else ever could. I hope that you learn how to show yourself the love you so richly deserve. Because you do deserve love, and you will not be able to fully receive it from someone else until you can receive it from yourself. Healing can be instantaneous, but it can also be a process. The darker the night gets, the more it makes sense to carry the pain. It seems right to hold it close, as if it will buffer us against more hurt. But it doesn't work like that. The tighter you hold that pain, the deeper it will burrow into your heart. Allow yourself to enter into the healing process. It takes work. It can hurt just as much, if not more, than the original wound. But once you embrace healing, once you allow yourself to walk that path, you will be blessed. Every breath is a blessing. Every second is a gift. Hope is real. You are loved with a perfect love. Jesus knows every part of your heart - the hurts, the dreams, the fears. There is nothing you can say that will scare Him away, or make Him leave you. He longs to be close to you. He loves you as you are, not as you "should" be, or as you want to be. You have done, and can do, nothing to deserve that love. Please don't put the untenable pressure on yourself of trying to deserve it. He will not turn you away or reject you. 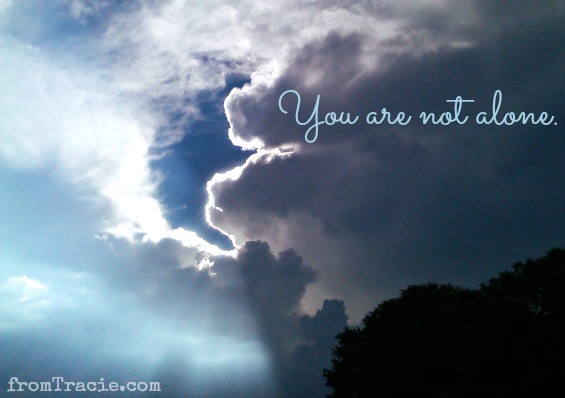 God loves you as you are right now. You are special. It is not your family, your birthplace, your grades, your beauty, your achievements, or even your actions that make you special. You are special because of your heart - your soul. The heart that maybe you don't feel safe showing to the world yet, the heart that has been broken and hurt more times than you can count, the heart that is so tired, the heart that doesn't know if it wants to keep beating, the heart that longs for more than it has and more than it has been given - that heart is the very core of who you are, and it is special. You have a sparkle, grace, strength and creativity deep within you. They might lie hidden, and feel far from reach, but they are still there. You have the ability to hope and dream. You are stronger than you know. You are amazing. God does have a plan for your life. This plan is perfect for you. It might not look perfect to anyone else. It probably does not make sense to many people, and maybe not even to you right now. But that is the mystery of God. His perfection, His plans, His purpose are not ours. Block out all the well-meaning voices telling you what you should do; allow yourself to step firmly into this seemingly crazy purpose, and you will find more perfection than you have ever known. I will be here. Cheering you on. Praying for you. Believing on the days you can't believe. I will stand watch with you. More importantly, Jesus is here, standing with you. You are not alone. Tracie, this is powerful. beautiful. true. Thanks for stopping by the Overflow so I could find you here. I don't know who she is but I hope she reads this and it tells her what she needs to know.. This is so beautiful tracie .. Thank you, Angel. I love you! Very well written. It is a very good reminder for all of us on this Wednesday morning. Thank you. You are so very welcome. It is a reminder for me, as well. Oh Ashley. Every word is true. You are in my heart and prayers today. I'm so glad it found you on the right day. Not only a letter to a young girl but a older women too. Yes! It is for all of us. Beautiful words to bring promise, hope and healing. May God use these words to minister to many women across the nation. As always, a beautiful post. I hope your friend sees these words and is able to let them into her heart. I love you. Thank you, Tia. I pray they find their way into her heart, as well. Love you!! This is really helpful, and although I'm halfway there already, this was a really good reminder. Thanks. I'm happy to know you are halfway there. Here's to the rest of the journey! Love you. True. "There will be very few moments of perfection, and most of them will not come as the result of planning or anything you can control;" wish I'd learned that one years ago...wonderful post! It was a hard-learned lesson for me. Once I was able to give up making those moments happen, I found it easier to appreciate them when they snuck up on me. What a thoughtful post! I hope it helps someone through whatever they are dealing with today, tomorrow, or later. It's beautiful. Thank you, Michelle. That is my prayer as well. Such a beautifully written letter. I was there once, but I found the way. It's true, hurt burrows deep in your heart and does so much damage. You also must know how to accept love from yourself before you can truly receive it from another. I am so glad that you found the way. That is a blessing. I held onto the hurt for far too long. I love this! A book that I just recently finished called Firsthand talks exactly about what you did--about admitting that it's ok to have doubts about our faith, about our God, because getting through those doubts is what makes us have true, authentic faith! I am going to add that to my reading list. The church school I grew up in was so legalistic, I did not know that it was okay to have doubts and work through them with the Lord until I was grown up. When life gets tough, it's writing like this that can really pull someone up out of a miry pit. Fantastic post! Thank you so much for your kind words, Julie. This really made my morning, Tracie. Fantastic post! Thanks Michelle. Blessings to you. Beautiful. And- I'm guessing- super important words for the gal who needs to (and hopefully will) hear them. Thanks Keely. That is my prayer. Such wonderful words that I know I needed to read! I'm so glad they found you on the right day. Blessings. This is beautiful Tracie and filled with so much truth. "In this life you will have trouble", He promises us in His word. The last few weeks have been hard for me. So many things that I can't even write about on the blog, but the struggles have brought me closer to God b/c I've remembered my need for full reliance on Him. When everything is going great I forget and put Him on the back burner, but His grace is enough and He will never leave us or forsake us. I'm so thankful for that! Yes. His word does warn us of the trouble that will come. I'm sorry you have been struggling the last few weeks - but I'm happy to hear that in those struggles you are drawing closer to God. That is such a blessing. I am thankful that his grace is enough. So very thankful. Tracie you made me cry! What a beautiful and touching post and all of it is so true! We have all been there and I am sure I will be there again before I leave this world. It is something that all of us go through. I'm glad you have found your way through those hard times. Tracie, this brought tears to my eyes. It's beautiful and written from someone who obviously has been there and understands. Thank you. I have, and I do. Thank you. Love you Rach. You are so very welcome, Lori. I am glad these words found you on the right day. Love you. Oh, how I wish I had read this a five years ago. This post is truly going to help people, Tracie! Thank you AnnMarie. So much of this is things I wish someone had told me when I was in that dark place. Much love to you. "You have the capacity to show yourself great love and mercy, or to hurt yourself more than anyone else ever could." How powerful! Yes self-love is not a cliche, not just words! Yes! I think so many people dismiss it as being just something people say, but it really is important. Hi Tracie. Thank you for stopping by my blog and leaving words of encouragement for me. What you have written here is beautiful, and I pray God uses them to reach many hurting people! Thank you Mandy. Your post series is so powerful and important, I know it is going to (and already has) touch many lives. This is beautiful and I am sure is and will be comfrting to many people. "Your story has not ended" has saved me in so many ways. I hope this girl and many others remember that every day we can begin anew. Yes. That truth has saved me, too. that was just beautiful and so true. I hope everyone reads this letter and truly listens and believes the words. Happy Saturday Sharefest. Thank you so much. Hope you have a wonderful Saturday. This post is truly amazing! I so needed to be reminded of each and every point in it. I am so glad it spoke to you. I really needed to read that letter today. Thank you. You are so very welcome. Blessings to you. Beautifully said. It's so important to tell people our story so they aren't so scared to tell theirs. It's also important to let them know we want to hear their story. That was what took me so long to tell the truth about my life -- I didn't want to burden anyone else with the heavy truth of my life. Oh, how wrong I was. I know you understand this. Thank you for this post. It matters. I love what you said about it being important to let people know we want to hear their story. Sometimes we have to make ourselves available to hearing those stories to provide that safe space for someone to share. So true and so beautiful. You have touched my heart today, Tracie. I truly needed to be reminded that God's love is perfect enough to allow for my imperfection. Much love to you, my friend. Don't forget you too are mightily loved and thank you for sharing that love! I am so glad these words touched your heart. God's love is always enough, and it is always there for you. It was Matthew 11:28 which first tugged at my heartstrings (from memory so possible mistakes) "Come to me all you who are weary and burdened, and I will give you rest. Take my yoke upon you and learn from me, for I am gentle and humble at heart. For my yoke is easy, and my burden is light." Yes!! Yes yes yes, and amen. Beautiful. Everyone needs to hear those words from time to time. I hope the girl sees she has some people who are there for her. Sometimes the hardest thing is the realization. This is a beautiful post! And that prayer: "I believe. Help my disbelief," has been such a powerful mantra for me over the past few years!